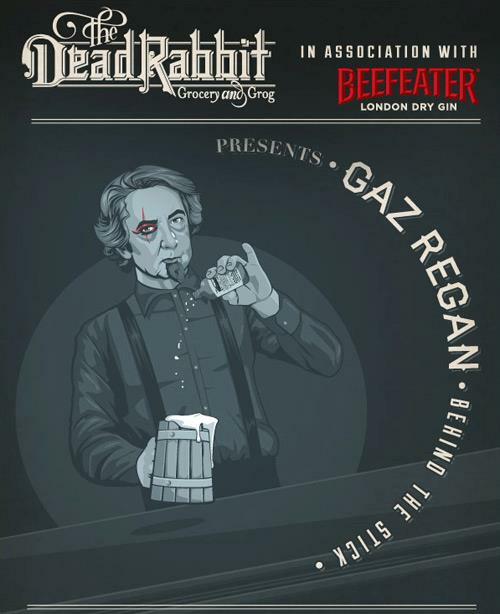 Gaz tends bar at the Dead Rabbit on Monday, Feb. 25. One of the most anticipated cocktail bars to open in NYC, The Dead Rabbit Grocery & Grog recently flung open the doors of its landmark building to much acclaim. Founders Sean Muldoon and Jack McGarry of the award-winning beverage program at Belfast’s Merchant Hotel have done their homework to create a cocktail menu that honors the mid-19th century drinking scene in gangland New York. On the first level, a pub-style bar room complete with sawdust on the floor serves up classic cocktails, bottled punch, draft beer and Irish whiskey, while upstairs a more refined lounge serves an expansive menu of meticulously crafted drinks. On a recent visit, I sipped the Automobile (Marie Brizard Parfait Amour, Pernod Absinthe, celery cordial, Piper Heidsieck Cuvee Brut Champagne and Bittermens Orchard Street Celery Shrub), the Ale Flip (Sixpoint Cask Conditioned “Dead Rabbit” Ale, Jameson 12 Year Irish Whiskey, spiced egg batter, muscovado sugar and nutmeg), the Bankers Punch (Redbreast 12 Year Cask Strength Irish Whiskey, Dead Rabbit Jamaican Rum Mix, fresh lime juice, raspberry cordial, Dead Rabbit Orinoco Bitters and dashes Graham’s LBV Port Wine), and a complimentary teacup of Grandieur Punch (Bols Genever, Varnelli Anis, lemon sherbert, lemon juice, orange flower water and peppermint tea). Everything was incredibly tasty, and the wait time for drinks was not long at all, a stunning feat considering there were only two barmen behind the bar and the room was full on a Saturday night. This Monday, Feb. 25, mixology master Gaz Regan will serve as guest bartender from 7 p.m. onward–so don’t bloody miss that. The Dead Rabbit, 30 Water Street. Speaking of new bars, Dipsology has a nice list of recently-opened and soon-to-open cocktail bars in NYC, including Attaboy, taking over the Milk & Honey space. Time Out New York interviewed Sam Ross and Michael McIlroy and rumor is they will open their doors later this month. Plans for Beefeater Gin’s visitor center. Image courtesy of Access Communications. Mini Hiatus: Dizzy Smalls Is Here! There's a party at my crib at 3 a.m.! You may have wondered what happened to this blog over the past month or so–why the silence? No, I did not drown in a vat of bourbon. Nor did I run away to Mexico to douse myself in mezcal. What’s happened, dear readers, is that I’ve multiplied! 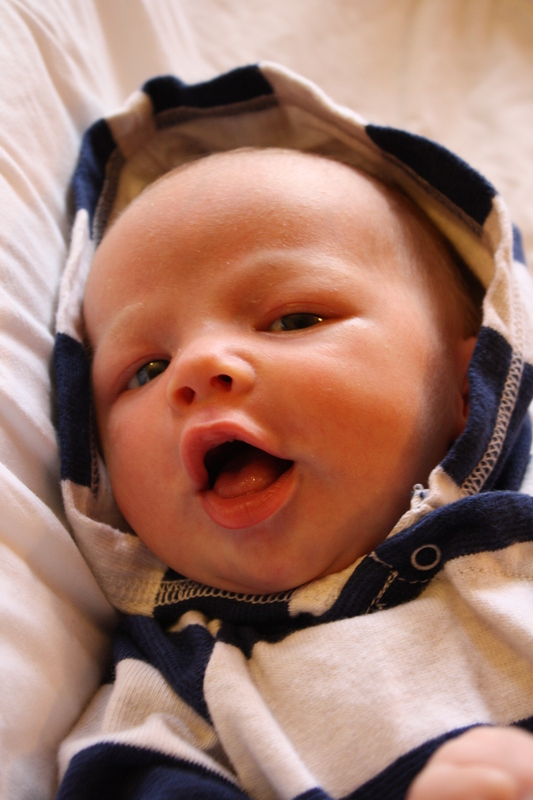 Well, myself and my husband have actually, with the addition of our beautiful baby boy, Owen Ezra. He was born on January 11 and he’s kept me busy making his milk punch of choice at the moment. I’ll be back on the scene soon enough, and until then, here is a link to an article about breastmilk in cocktails, in case you’re into that sort of thing. Cheers! 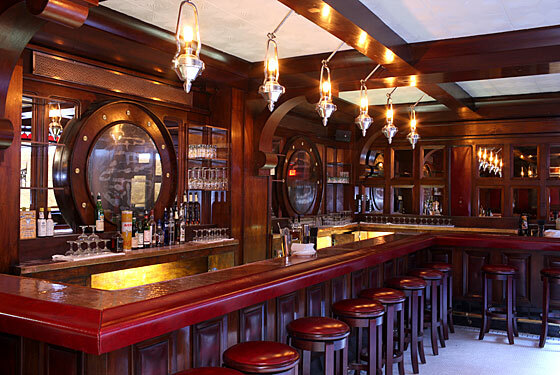 The Rum House in Times Square, beautifully restored by the Ward III crew, opened earlier this week. Photo my Melissa Hom, New York Magazine. Since El Cobre let the rum flow in December, January of 2011 has been a good one for cocktails with the opening of several new bars and more on the way. The West Village’s Fedora reopened with a seasonal menu and the promise of barrel-aged cocktails. Another reopening, The Rum House in Times Square, was orchestrated this week by the owners of Ward III (more photos here), bringing classic drinks and fresh polish to the piano lounge. What’s most exciting is that drinks are $12-$14, a steal for the neighborhood. 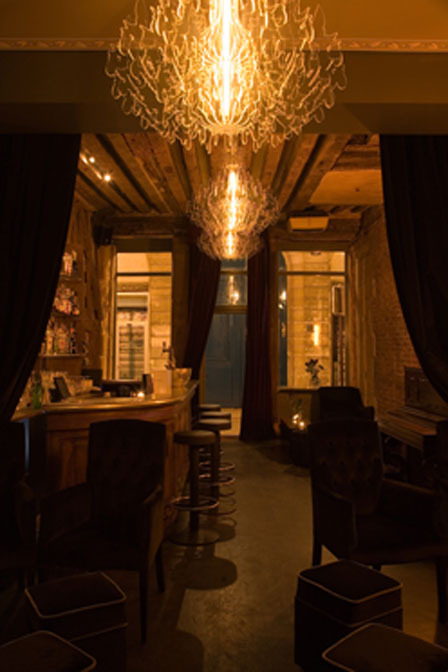 And The Mulberry Project, a cocktail cave in Little Italy, was recently opened by alums from Milk & Honey, GoldBar and Bagatelle. Later this month, look for Williamsburg’s Maison Premiere oyster bar with cocktails by Maxwell Britten, along with Teqa taqueria and tequileria in Murray Hill. And in February, Locanda Verde’s Andrew Carmellini brings The Dutch to Sullivan Street in SoHo with a cocktail program by mixologist and spirits writer Naren Young. On a completely opposite note, a new Duane Reade drug store in Williamsburg is selling beer by the growler to stand out from the mom-and-pop pharmacies. I’d say something about this being another nail in the coffin for the hipster-hood, then again, that coffin is plaid, covered in wheat paste graffiti and sold by Urban Outfitters. On January 25, Edible Manhattan is hosting Good Spirits at Le Poisson Rouge, a mash-up of some of the city’s finest food and drink featuring top chefs and mixologists. Get a sweet discount on the $40 ticket price here, and you’ve got no excuse not to go. Super! Last night at Dram in Williamsburg, I had the good fortune to bump into Romée De Goriainoff, co-founder of Paris’ Experimental Cocktail Club, who was there to visit Nicolas de Soto, a former ECC bartender, behind the stick. Opened at 37 Rue Saint Sauveur in 2007, the ECC is Paris’ premiere cocktail speakeasy and is one of the few bars in the city open after 2 a.m. on weekends. The clandestine 40-seat lounge oozes with 1920s charm and features tipples such as the Experience #1 (Hendrick’s gin, elderflower liqueur, lemongrass, lemon juice and basil) for 10 to 12 euros. Following the success of ECC, its owners opened Left Bank outposts Curio Parlor Cocktail Club, at 16 Rue des Bernadins, and Le Prescription Cocktail Club at 23 Rue Mazarine in the sixth. Two ladies have a smoke outside the Experimental Cocktail Club. Photo by Didier Goupy. Brad Estabrooke of Breuckelen Distilling Co. shows off his drinking philosophy. On Sunday, August 1st, I nearly shed a tear as I witnessed a historic moment in NYC drinking culture–the first spirits distilled here since the days of Prohibition were served to the general public at two Brooklyn locations. 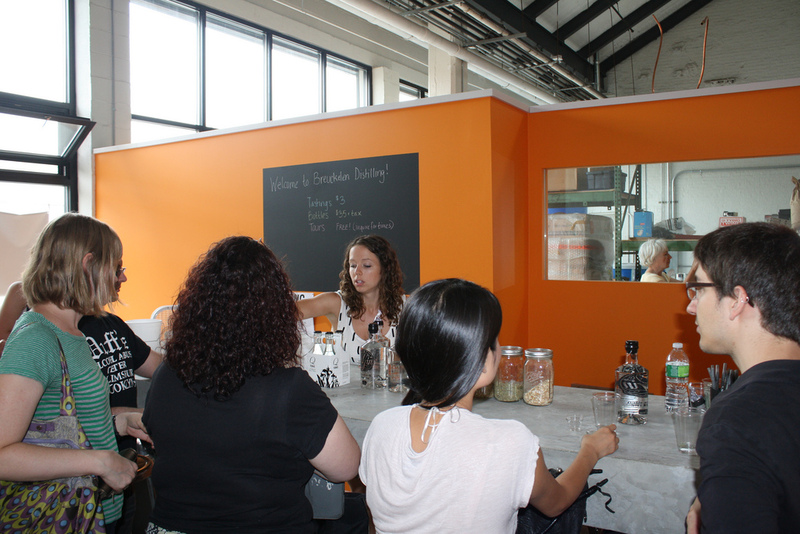 Kings County Distillery, the little moonshine makers that could, poured their unaged corn whiskey–which also features malted Scottish barley for added complexity–at UVA Wines & Spirits in Williamsburg, while Breuckelen Distilling Co. flung open its Sunset Park doors to a thirsty crowd for tastings of its wheat-based gin and tours of its small factory centered around a 400-liter German copper still. I visited both distilleries last month before they opened, and the yeast-scented anticipation hanging in the air was nothing short of infectious. Hard at work on a daily basis since spring, Brad Estabrooke of Breuckelen and Kings County’s Colin Spoelman and David Haskell–all in their early 30s–represent the new generation of distillers pioneering the artisanal spirits renaissance. 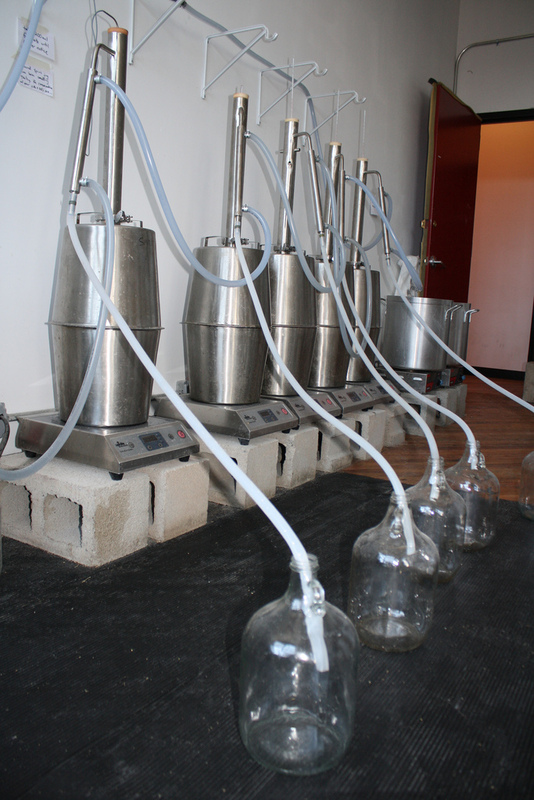 Recent changes to state law have made microdistilling easier and more affordable. But unlike their rural New York counterparts, these guys face the unique challenges of their urban environs. 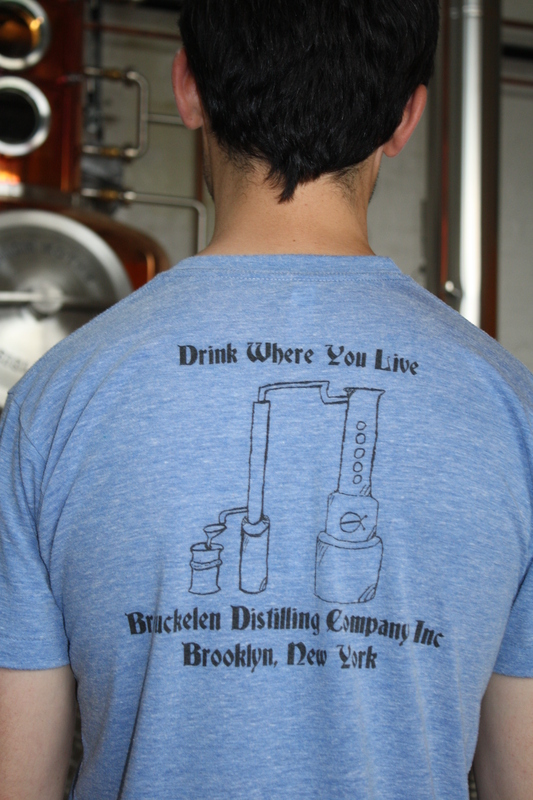 With a production output of about three times the size of Kings County’s, Breuckelen Distilling Co. at 77 19th St. is a dream come true for Brad, who came up with the idea to start a distillery with his girlfriend, Liz O’Connell. 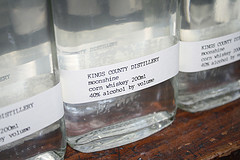 Kings County’s moonshine can be purchased at UVA and Thirst Wine Merchants in Brooklyn and at Astor Wines & Spirits and Park Avenue Liquor Shop in Manhattan. Kings County Distillery's pot stills. 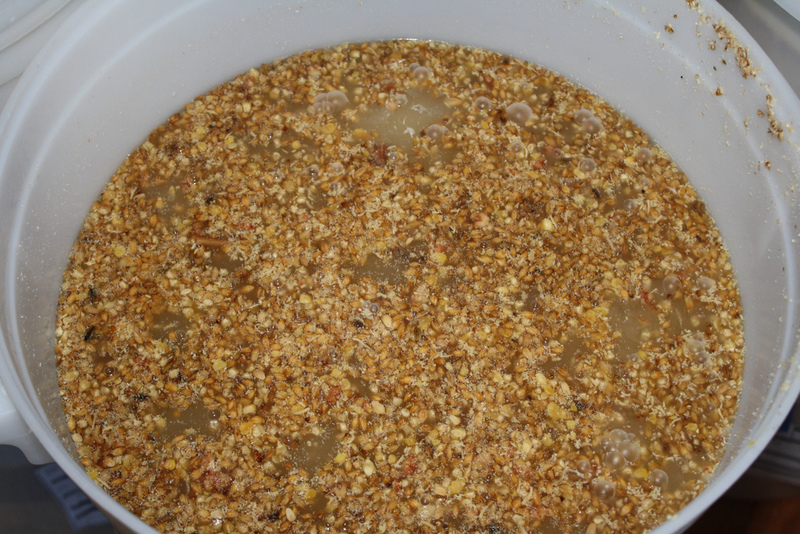 Corn sourced from upstate New York is the base of the moonshine. 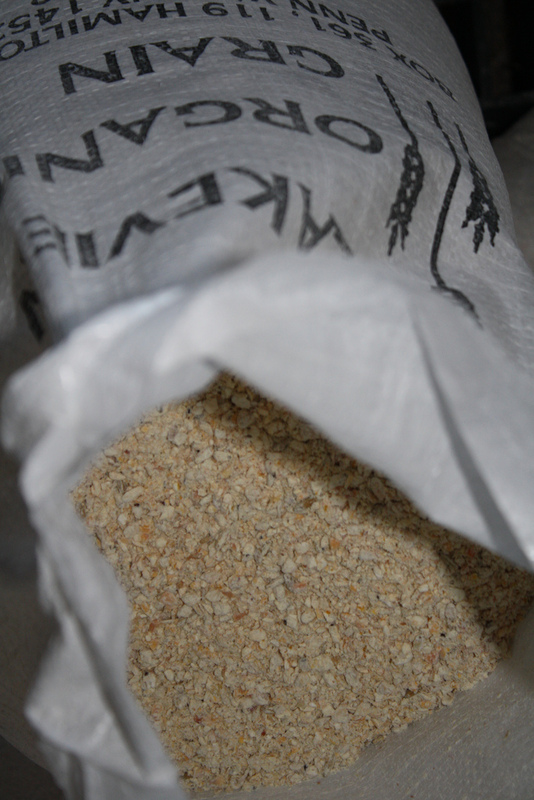 Fermenting corn and malted barley. 200ml flasks of moonshine feature labels made on a typewriter. 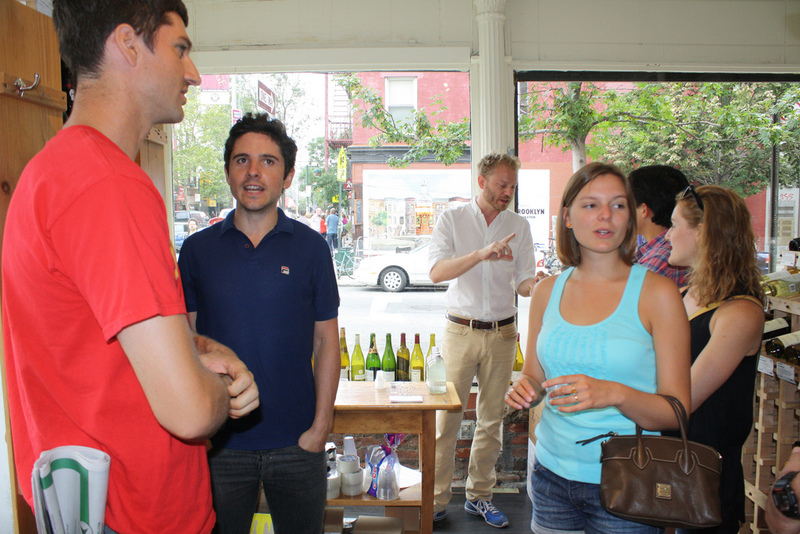 Kings County's inaugural tasting day at UVA Wines & Spirit. 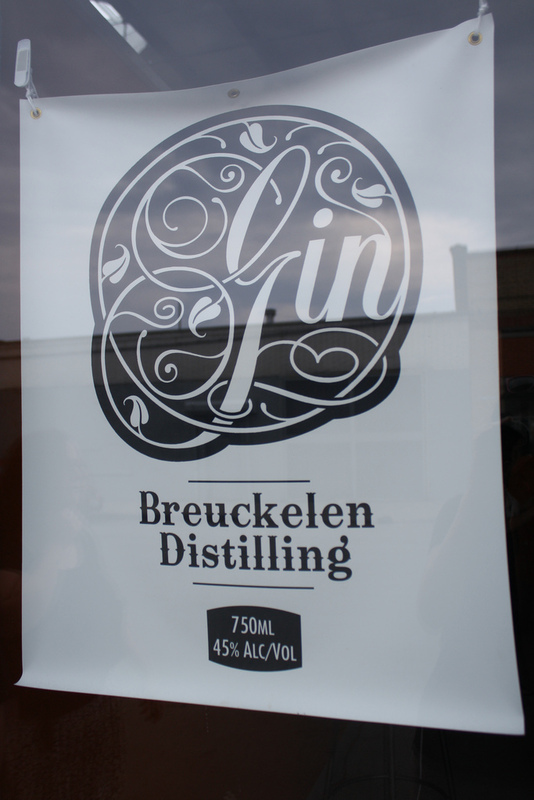 Breuckelen Distilling Co. is open for business. 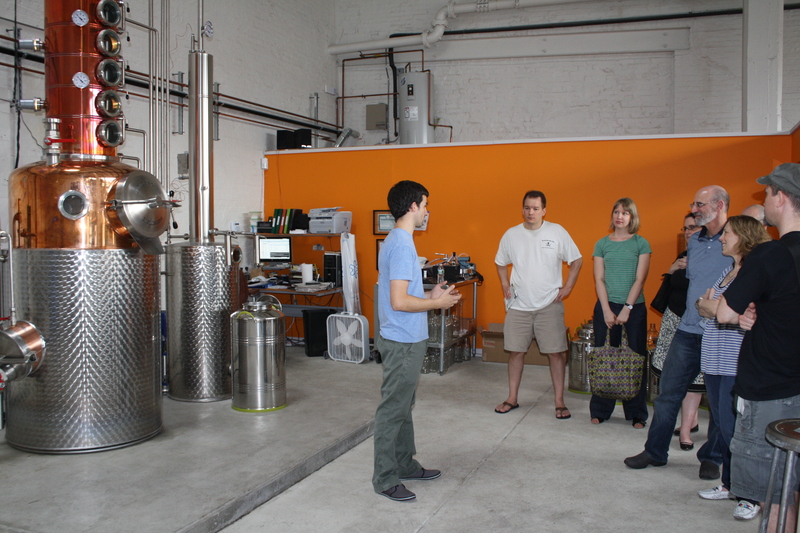 The tasting room at Breuckelen Distilling Co.
Brad Estabrooke leads a tour of his distillery. 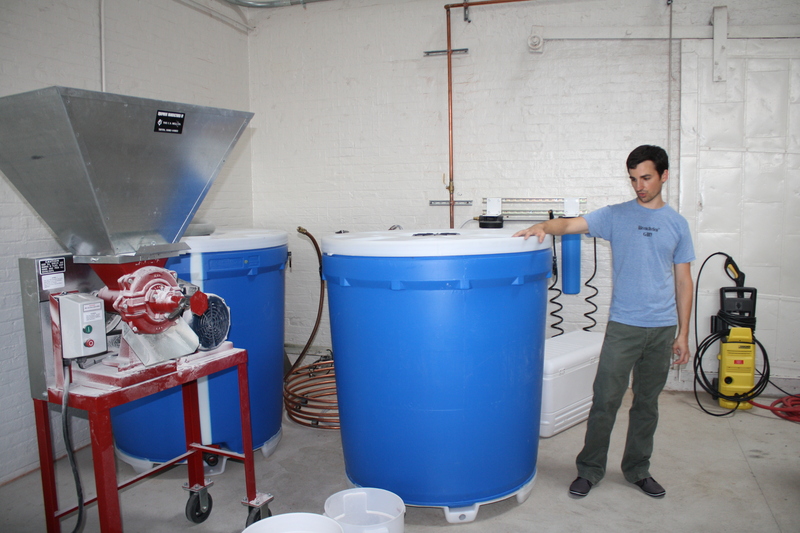 This is where the fermenting magic happens. 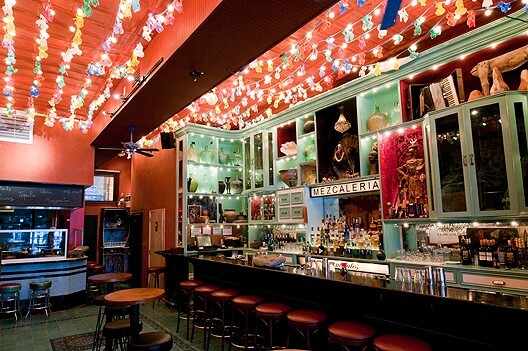 Casa Mezcal, now open on Orchard Street, features drinks by Junior Merino. Photo via Eater.com. Casa Mezcal, a ground-level mezcal bar within a three-story property that will soon include a Oaxacan gallery and a basement-level bar/cinema, opened at 86 Orchard St. in early June. Featuring a wide variety of sipping mezcals, including some obscure varieties, the bar also offers a cocktail menu designed by Junior Merino. A Mexican food menu will be added as soon as the gas is turned on, until then complimentary bites include fried grasshoppers and pico de gallo. The mezcaleria is within stumbling distance of two of NYC’s most rambunctious cocktail bars–Painkiller and The Randolph–creating a “Cocktailian Bermuda Triangle,” if you dare. Legislation that could have a severe impact on NYC nightlife is on the table. Eater reports that State Senator Daniel Squadron has submitted a bill that would revoke a bar’s liquor license if police receive six or more noise or disorder complaints within a 60-day period. This comes on the heels of a bill from Brooklyn Assemblywoman Joan Millman that would impose an 11 p.m. curfew on rooftop and backyard bars on weekends and 10 p.m. on weeknights, as reported in the Wall Street Journal. 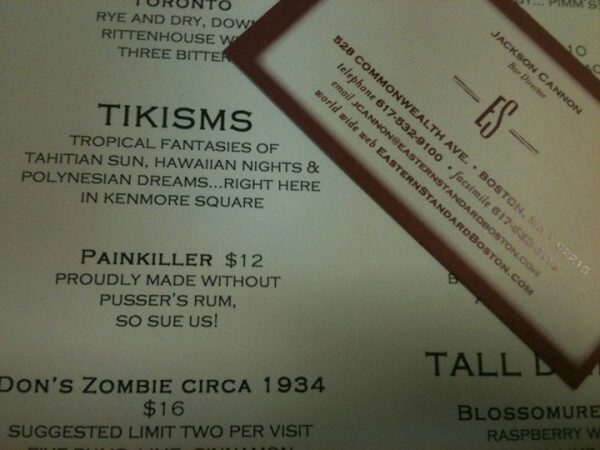 Let’s hope both of these bills go nowhere–NYC nightlife generates renevue that the city can’t afford to lose. Tribeca cocktail den Ward III celebrates its first anniversary this weekend, offering specially-priced cocktails, as reported by NY Barfly. Check out Hendrick’s Gin drinks tonight and Maker’s Mark tipples tomorrow night. Speaking of Maker’s Mark, the Kentucky distillers will be launching their first new bourbon in 50 years, Maker’s 46, next month. Check out blogger DrinkBoston.com’s report from Louisville on how the special edition bourbon is made–the secret lies in the seared French oak staves. Retailing for $35, the 46 (named for the fact that it was simply the 46th recipe) will be a toasty addition to any Maker’s lover’s liquor cabinet. Tales of the Cocktail in New Orleans is just around the corner–July 21-25, and the 2010 Spirited Awards nominees were recently announced. New York swept the awards last year, and based on the high number of talented bartenders and bars up for honors this year, the city could see another coup–good luck! 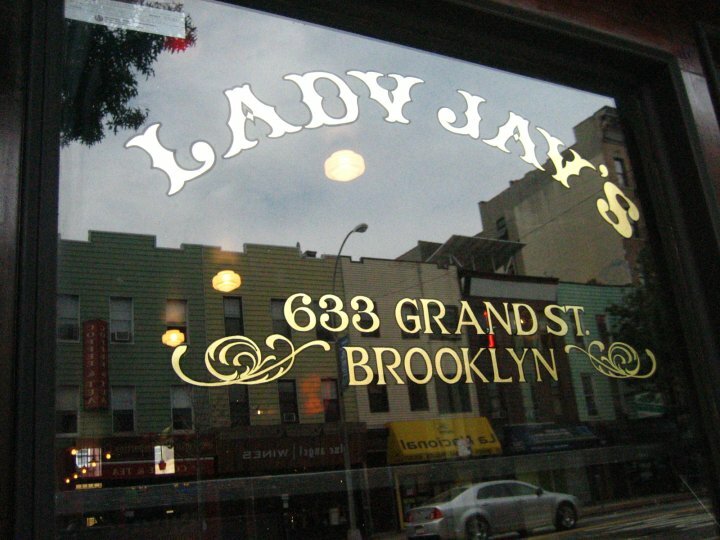 Sam Mason, formerly chef at now-shuttered SoHo restaurant/cocktail den Tailor, has opened a no-frills dive bar, Lady Jay’s, at 633 Grand St. in Williamsburg next to Bushwick Country Club. The bar, which Eater reports is across the street from his apartment, has neither fancy cocktails nor food–just whiskey, beer, shuffle bowling, a jukebox and standard hipster decor–antlers on the walls. Sam Mason brings a hipsteriffic dive bar to hipsterburg.